On June 16th, Amazon announced its intent to acquire Whole Foods Market for $42/share in cash, valuing the business at $13.7bn, a 27% premium to Thursday’s close. The deal has unique implications for Amazon and the retail landscape as a whole. Amazon and Whole Foods traded up on the news, but it sent shock waves through the entire grocery retail space, as investors feared traditional grocery stores and other retailers would become ‘Amazoned’. We own Amazon in FSP Internal Equity Strategies: Strategic Growth, Partners Advantaged, and Growth & Income Blend. The Whole Foods acquisition shows how rapidly the retail landscape is evolving. We are now seeing a convergence of retail business models: legacy pure-play internet stores are exploring real-world stores, and real-world stores are increasingly prioritizing e-commerce. Going forward, lines will blur between internet-only and bricks-and-mortar businesses. The new ‘Synergistic Model’ will be channel-agnostic, showroom supported, and heavily influenced by e-commerce and direct-marketing. There will be far-reaching implications for the retail industry, and Amazon is clearly positioned to win in the new retail environment. Amazon is now among the world’s highest-grossing retailers. Having made significant capital investments over the past decade, Amazon’s fulfilment and distribution network revolutionized the retail landscape. With its significant scale and lack of a traditional retail footprint, Amazon can price well below traditional retailers, reinforcing its competitive advantages. Amazon’s industry-leading fulfillment and distribution centers, technology, user base, product breadth, and content have created a very substantial ‘network effect’ to continue driving advantaged economics and sustained growth. We believe it would be virtually impossible for a competitor to replicate the scope and reach of Amazon’s retail network and customer base. Amazon ‘Prime’ subscriptions hit 80 million in early 2017, generating annual recurring revenue from fees and a significantly higher percentage of repeat purchases. International expansion is another growth opportunity for Amazon, with just 32% of sales generated abroad in 2016. Amazon’s enterprise technology segment, Amazon Web Services (“AWS”), is also an industry-leader, revolutionizing the cloud market. With a diverse opportunity set for sustained growth, we expect Amazon to remain a disruptive force in retail and technology for the foreseeable future. Amazon Web Services: What is AWS, and why is it a Game Changer? 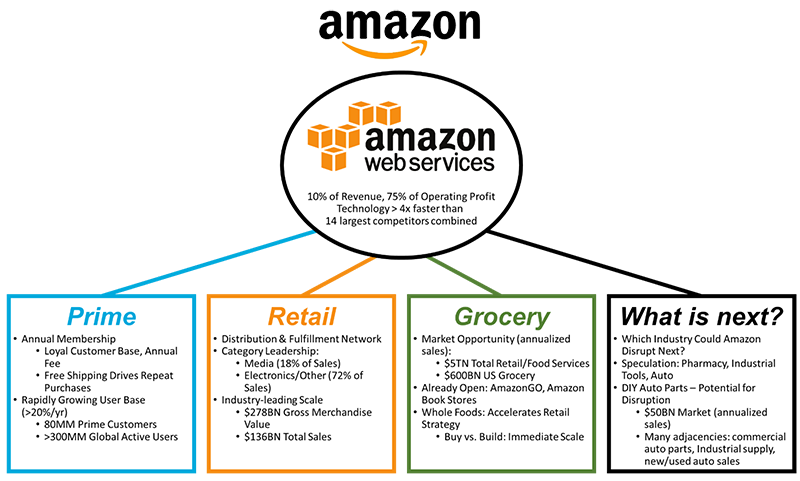 Amazon Web Services (“AWS”) garners little attention relative to Amazon’s retail operations, but is an incredibly important component of the overall business model. AWS posted $12.2 billion in revenue during 2016, just 10% of the overall company’s total, but the segment generated over 75% of the company’s operating profit. Similar to Amazon’s retail businesses, AWS has sustainable cost advantages, a very sticky and deep customer base, significant scale, and industry leading technology, making Amazon the preferred name for corporations worldwide. We believe AWS is uniquely positioned in the cloud space, despite new products from Microsoft Azure and Google. Amazon’s offerings not only lead in technology enhancements, but their scale allows them to lead in price, making AWS a compelling choice for enterprises to reduce technology expenditures. AWS is expected to grow both revenue and profit at significant double-digit rates over coming years, enabling Amazon to reinvest in the business and expand its technology leadership. Amazon’s acquisition of Whole Foods adds an additional ‘leg’ to its retail growth strategy, and is a logical extension of their online, fulfillment, and distribution expertise. We believe grocery is a key element of Amazon’s strategy, as the company has been testing bricks-and-mortar stores for a few quarters, launching Amazon Book Stores in major US cities and an ‘Amazon Go’ grocery in Seattle. Whole Foods will give Amazon immediate scale and density in the grocery vertical, with a particular skew towards affluent households and locations. Amazon is also gaining a closer presence to the end customer, and a store-based distribution network that would have otherwise taken years to build. As Amazon evolves the Whole Foods brand, we expect to see significant technology enhancements (‘last-mile delivery’, Prime-based transactions, Connected-Home compatibility, etc). AMZN paid less than 3% of its total market cap for this nationwide retail distribution network, entry into a massive vertical, and significant cross-sell opportunities. Amazon’s Next Disruption: Implications for Other Industries? The importance of the Amazon/Whole Foods transaction and its impact on a critical retail vertical clearly invites speculation to other potential industries that could be affected by greater Amazon attention. Rumors abound on businesses from pharmacy to industrial tool distribution, but we believe the retail, do it yourself (DIY) auto parts industry and its $50B in domestic annual sales may also provide a compelling opportunity. In January, reports began swirling that Amazon had growing interest in the space and had signed supply contracts with several large parts manufacturers to begin direct-to-consumer sales. This news caused weakness in auto parts retailing stocks that has continued through 2017. Similar to Whole Foods and the grocery industry as a whole, Amazon could use this share weakness to acquire an established competitor and combine its vast fulfillment and distribution capabilities with an established bricks-and-mortar franchise to truly disrupt the existing environment. The DIY vertical could also lead to other adjacent business lines, such as commercial auto parts, or to something as large as the used automobile sales industry. Based on its synergistic model and well-developed competitive advantages, we feel Amazon can and will reshape a vast number of different industries in coming years. 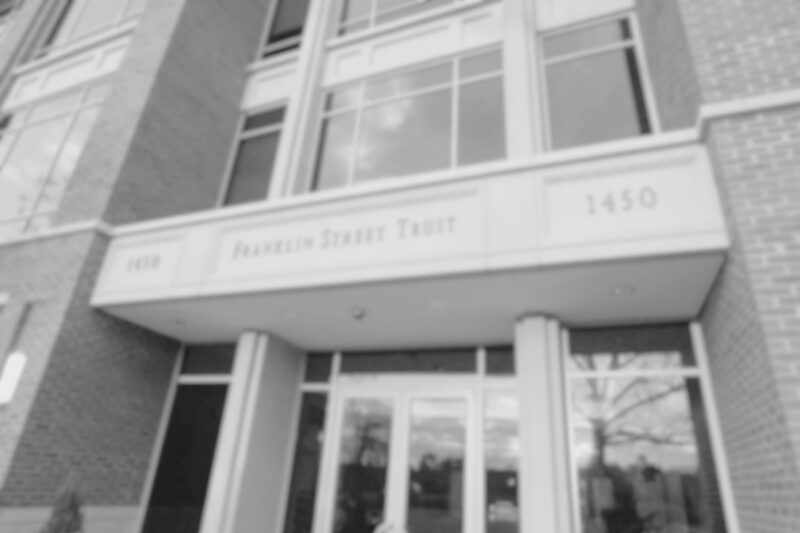 This document is not to be construed as an offering or intended as a recommendation to buy or sell securities and is being provided for informational purposes only. These points represent the opinions of the authors, and as such, should not be construed as investment advice. Results shown are purely historical and are no indication of future performance. Past investment performance should be only one of several factors when engaging an investment manager.